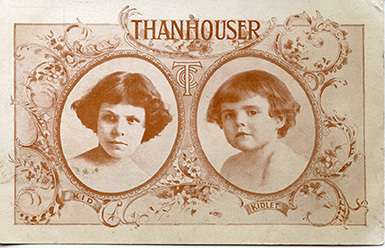 The Thanhouser Kid and Kidlet were prominently featured in Thanhouser marketing efforts. Postcard courtesy Thanhouser Company Film Preservation, Inc.
Thanhouser's June release schedule began on the first of the month with Harry Benham and Mignon Anderson in A Victim of Circumstances, a film which The New York Dramatic Mirror considered to be "an improbable story well done." A romantic drama which is unsuccessful in capturing a convincing romantic atmosphere. The king's daughter, believing herself a caged bird, runs away among the peasants, after liberating her little canary. The unkindness and rudeness which she encounters among the rough subjects of the lower class bring a change of thought, and she returns to the castle to marry her father's choice, the prince of the neighboring kingdom. In the first place, the costuming, with a few exceptions in the courtroom scene, is not regal, and the boudoir of the princess looks more like a New York flat than the room of a castle. There is a sudden and puzzling jump in the story when the princess starts to run away, appearing abruptly in peasant garb. Marguerite Snow plays the princess. The Runaway, released on June 6th, featured Marie Eline and Helen Badgley, the Thanhouser Kid and Kidlet. As was the case with nearly all of the films featuring this duo, reviews were good.